Its AR tech brings relevant audio content to your activities. Bose announced today that it's getting into the augmented reality game. But Bose AR isn't about video, it's about audio and through a "wafer-thin acoustics package," the company says it can introduce a useful and relevant layer of audio into your everyday activities. Bose says the small audio technology produces powerful and clear sound and can be incorporated into wearables like headphones, eyewear and helmets. "It places audio in your surroundings, not digital images, so you can focus on the amazing world around you -- rather than a tiny display," John Gordon, VP of the consumer electronics division at Bose, said in a statement. "It knows which way you're facing, and can instantly connect that place and time with endless possibilities for travel, learning, music and more. And it can be added to products and apps we already use and love, removing some of the big obstacles that have kept AR on the sidelines." Bose sees the technology being useful in a variety of settings. While traveling, for example, Bose AR could be used to simulate historic events at landmarks, play a speech from the historic figure whose statue you're standing in front of or help you navigate an airport. Bose's AR tech could also help translate a sign you're reading or provide the history behind a painting you've approached in a museum. And when listening to music, you wouldn't need to mess with your phone when wanting to change a song. Instead head movements would allow you to navigate your playlist. There's no camera or lens included in the system. Alternatively, a Bose AR wearable would use sensors to track head motion and an iOS or Android mobile device's GPS to determine location. That data would then be aggregated by a companion app, which, based on that information, would return relevant audio content to the user. 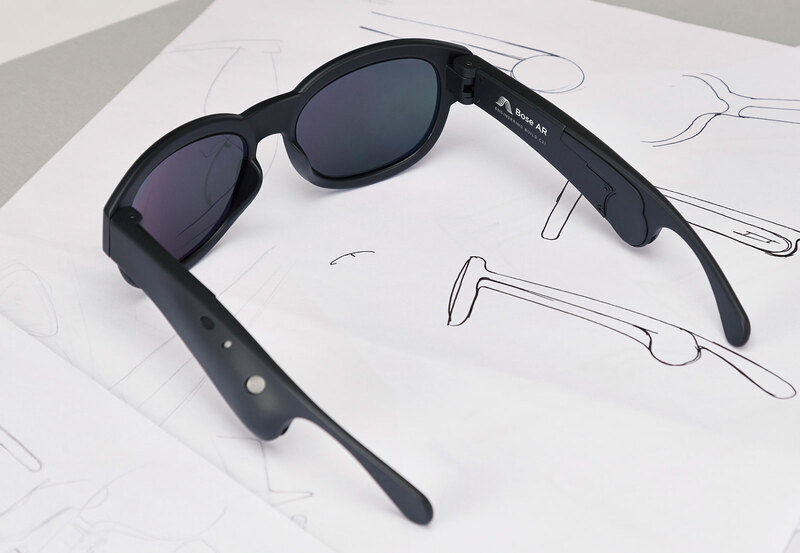 The company has developed a prototype pair of glasses that incorporates its AR technology. The tiny acoustics package is embedded into each arm, giving the glasses headphone-like functionality. A Bose spokesperson told CNET that the glasses will only be available to developers and manufacturers at first and the company says it will likely have an updated version of them as well as its AR SDK ready this summer. Bose is collaborating with companies like Strava, TripAdvisor and Yelp as well as academic institutions like the MIT Media Lab and the NYU Future Reality Lab. Additional collaborations will be announced in the future.